I have been desparate for a new pair of jeans for awhile as my 'good' pair is now being worn while I garden. I bought a jeans kit from Heather Lou Closet Case Files last year. It's a great kit including blue and black stretch denim - a generous amount, Im sure I could make a pair of jeans for my granddaughter with what is leftover, 2 zippers, 3 buttons, rivets, a packet of Schmetz jeans needles,and topstitching thread. I also bought Heather's ebook on making jeans and it is awesome. It contains endless little details that make the difference between an amateurish look and a professional one. By my measurements, I am a size R on the Jalie sizing chart. I made a muslin using broadcloth as I didn't have any appropriate stretch material. It was scarily tight, especially at the waistband, so I didn't think the added give of the stretch denim would solve the problem. So I made the next size up - S.
I made a couple of changes to the pattern. 1. I traced off all the pattern pieces with a 5/8 inch SA. That way if the pants were still too tight, I had some leeway. 2. I had some cute stretch cotton print with little bicycles on it (from Blackbird Fabrics) in my stash leftover from making my daughter a bike skirt so I used it in the waistband and the front pockets. For the waistband, I folded the pattern piece in half lengthwise and then added the seam allowance to the fold side. Then I cut one piece from the denim and one from the stretch cotton. The only change I made in the front pockets was to turn the pocket facing over so it would be visible from the inside of the jeans rather than from the inside of the pocket. I did leave the pocket lining oriented as instructed in the pattern as I thought the edge of it could potentially be seen from the front. 3. I interfaced the back pockets before adding the personalized design. 4. I made the fly shield as described in the jeans ebook, sewing a diagonal seam at the bottom. Sewing machines: Janome Memorycraft 6600 professional, Brother 3034D overlocker. To personalize the jeans, I wanted to put something different on the back pockets. As I am a dual New Zealand and Canadian citizen, I decided to put a maple leaf on one pocket and a kiwi bird on the other. I traced the design onto lightweight tracing paper then pinned it onto the pocket and topstitched directly over the pocket. 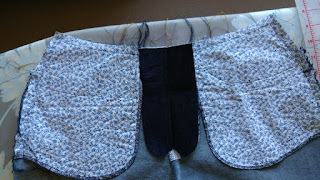 I used what I think is called a saddle stitch (Mode 2, Pattern 05 on my Janome). Then I just tore away the tracing paper. For the seams, I had to increase the thread tension to 5.5. I sewed a regular seam L 2.5mm, then trimmed it and overlocked the 2 seams together before topstitching using Gutermann Mara thread at a stitch length of 3.0. For bartacks, I used L 0.5, W 1.5. The buttonholer on my Janome isn't very reliable so after 3 practise buttonholes and 1 1/2 failed buttonholes on the jeans, I just made the buttonhole using a ZZ stitch (L 0.4, W 2.5 & 5). After opening the buttonhole and applying fray stopper, I went over the sides (ie the 2.5mm width) a second time, just to be sure. I skipped the rivets as I had visions of making unhidable holes with the awl! The pants fit very well and are really comfortable. There are wrinkles on the back of the legs but my guess is if there weren't any, it would be hard to sit down. They don't catch on my calves, no button digging in at the waist, comfortable when sitting, what more could I ask for? Plus I'm sure no one else has a Kiwi and a maple leaf on their back pockets! Your jeans look wonderful and those pocket details are fabulous.